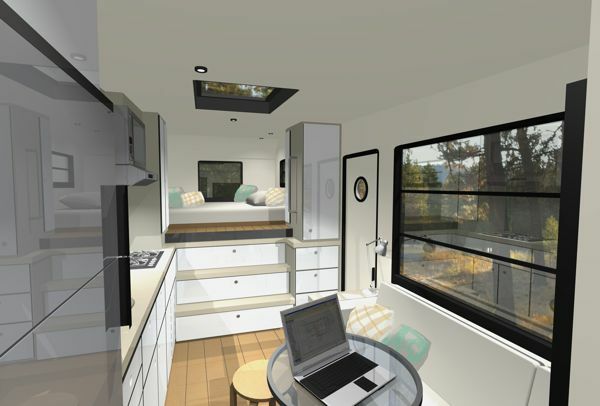 See two amazing designs for a custom motorhome by a Portland, Oregon architect. They're based on an Itasca Navion motorhome. You'll wish you could buy one. This article was written by Robert Moreland of MCM Design. Robert is a Portland, Oregon architect who has spent 35 years designing quality homes. These RV designs are his first stab at making his own “Tiny House”. 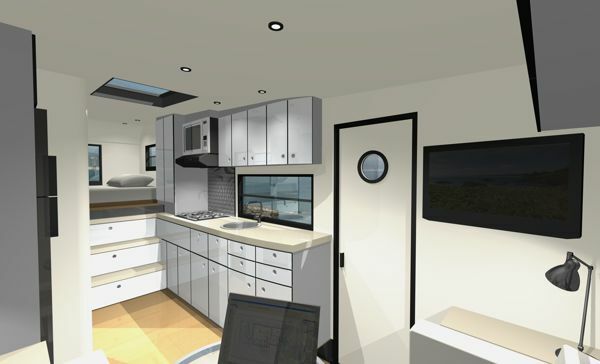 As an architect, I had a tough time finding a motorhome that had an interior design to my liking. I wanted an efficient layout that was both contemporary and comfortable. 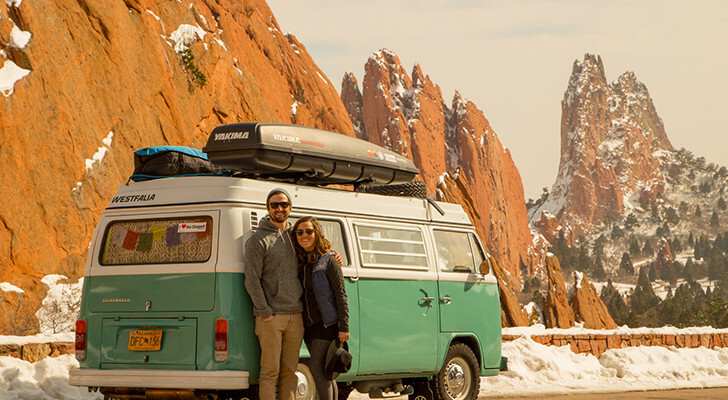 After looking for months, I found that few motorhome models in the US met these criteria. 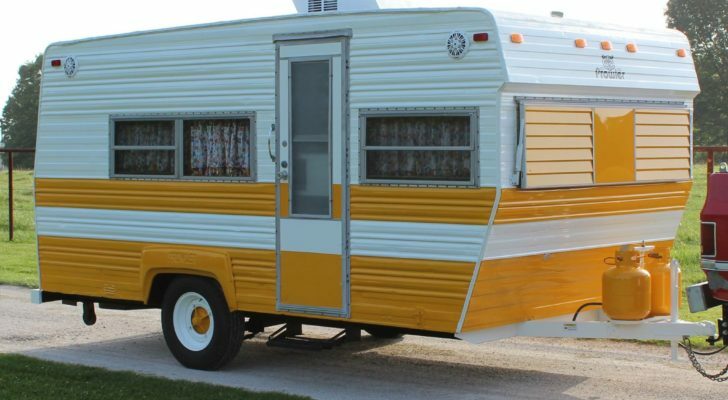 Winnebago had some nice models, but nothing stood out as a clear winner. 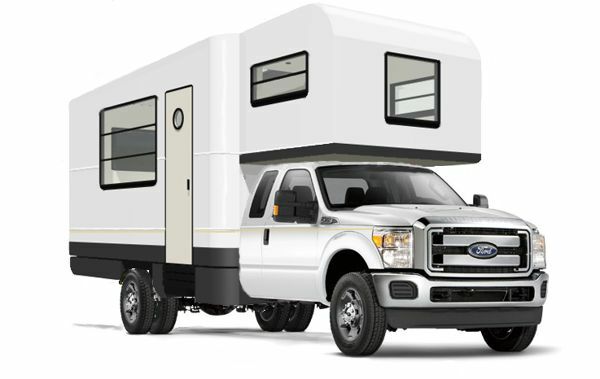 I thought about buying an Itasca Navion, but then it occurred to me that if I couldn’t get the custom RV design I wanted maybe I should just design my own? I had never tried designing a custom RV before. My first attempts for my own custom RV are these two 26’ long design concepts shown below. 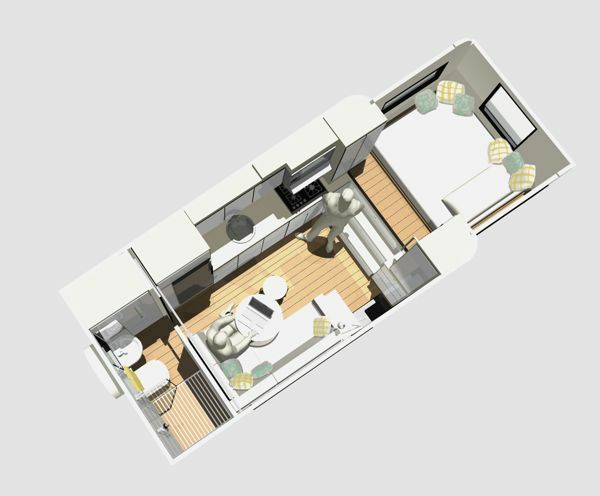 The first has a bathroom in the rear to give a larger open space. 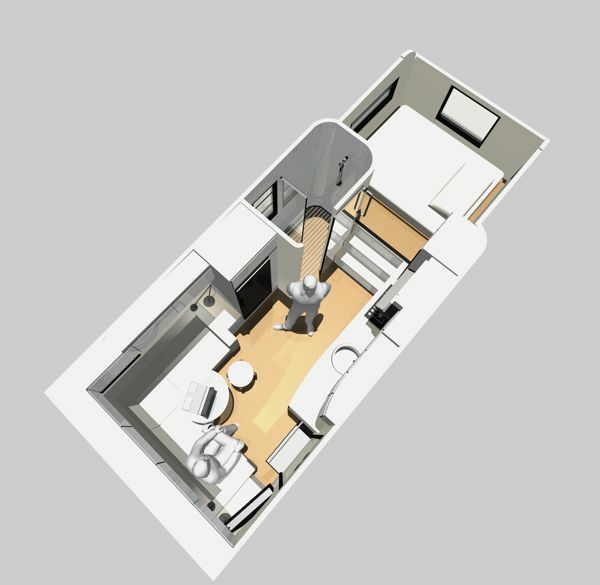 The second features a mid-bathroom layout so that the main sitting area is in the rear where the view at most campsites is most likely better. RVs that are designed to sleep a lot of people usually have a small general living space. For a dinette to convert to a bed, the seat cushions and backs have to be flat, making sitting at them very uncomfortable. Both of my custom RV designs utilize an easily accessible cab-over full size bed. Three wide steps that double as storage drawers provide easy access to the bed. There’s no need for climbing ladders in the middle of the night. Plus, the wrap around sofas are long enough to sleep an overnight guest. 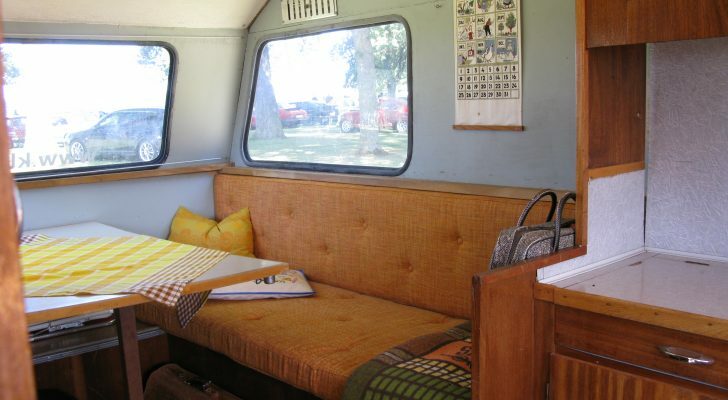 These custom RVs are designed for a single person or a couple. 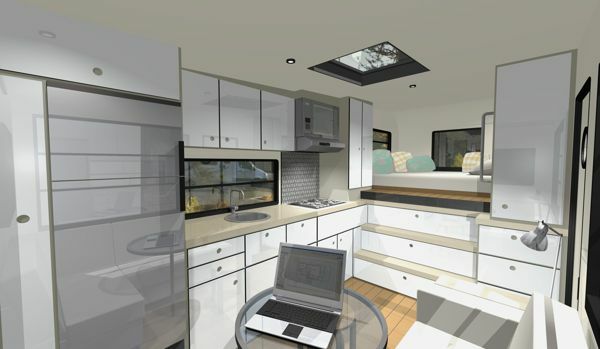 I believe that baby boomers, like myself, are going to want custom RVs with less sleeping space and more living room. 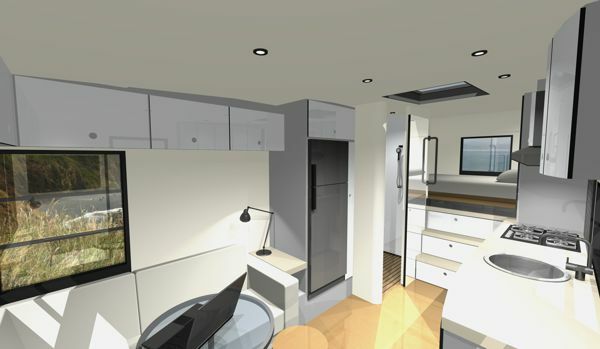 The kitchen areas in my designs are also much larger than those found in ‘stock’ setups. Part of my attraction to the RV lifestyle is having great meals with good friends in the beautiful outdoors. 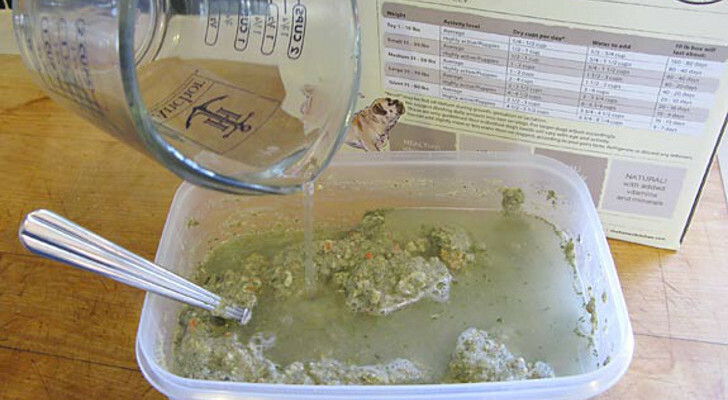 To make a large meal you need counter space and a sink large enough to clean up the pots and pans afterward. 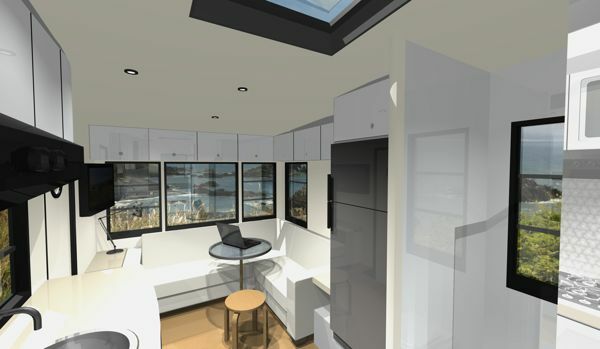 Both designs have 6’ of counter space and enough room so that two people can work side by side with ease. I also want the designs to be environmentally responsible and to use sustainable materials as much as possible. This means making the custom RV as light as possible, using aluminum construction and avoiding heavy slide-outs. There is no reason that kitchen cabinets be paneled with wood and topped with granite counter-tops. Many other materials are lighter and have just as nice of a look. 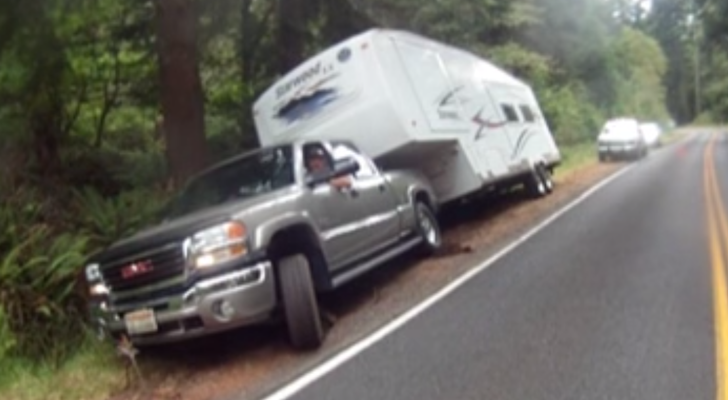 RVs have a lot of things attached to exterior surfaces which make gas mileage poor and open the rig up to leaks during rainy weather. While I don’t have a solution for the rooftop air-conditioner yet, I think the side awing on my custom RV can go. You can buy a folding shade structure that will work just as well and not clutter up the outside of the rig. These are designs in progress. I hope to be able to price and test their feasibility soon. If you would like to see more detailed plans visit MCM Design. Thanks for your input Okey. I think Robert designed this RV for part-time use only. He might have made some changes had he intended to live in it full-time. while I agree with the designers concerns and interests there would be problems for full-time or such as myself. The first is just the comfortability factor. I don’t like being in the space where I feel like I have to go outside to change my mind. On the second or some of the features I just don’t think would work well for full timers. The great thing is the elevation and the aerodynamic design of the motorhome. I’m always appreciative of people who have the talent and means to improve the RV lifestyle. Thanks for your comment Tiffany! 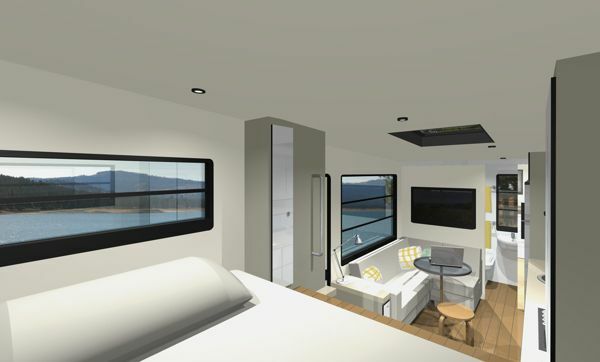 Robert definitely has a talent for designing appealing RVs. These are fantastic. We also agree that Winnebago had the best designs at the Tacoma RV show (with Airstream right up there, of course). We’re toodling around in a bright yellow [email protected] for the moment but we’ll eventually want something bigger. 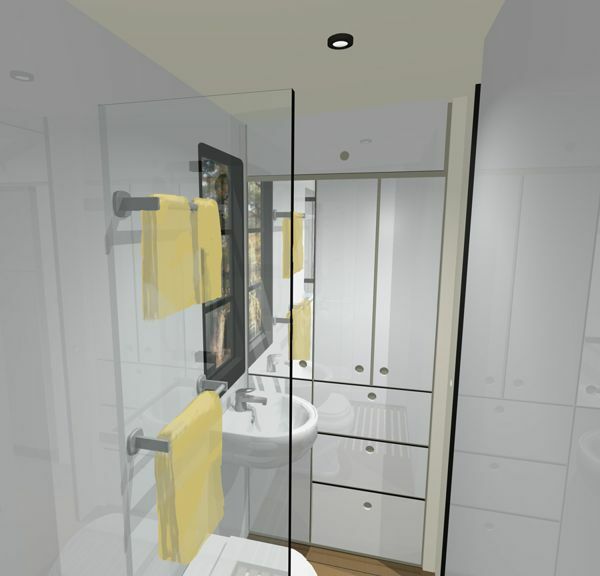 We will definitely look you up when we need our <1000 sq ft full-time small home designed. These would modify nicely once we find a great piece of land. Please add us to your mailing list. 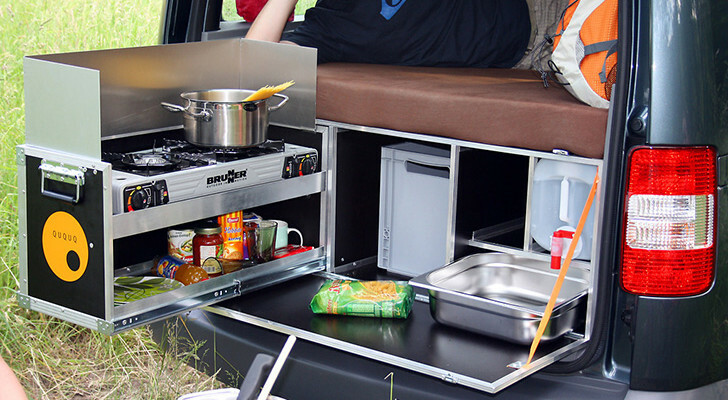 At last, an rv that looks livable. But, you could eliminate the bathroom and have primo living space. Seriously, most campgrounds have acceptable shower facilities. Carrying around the family crap and the clean out process are just disgusting. Your right scratch the awning and ac. 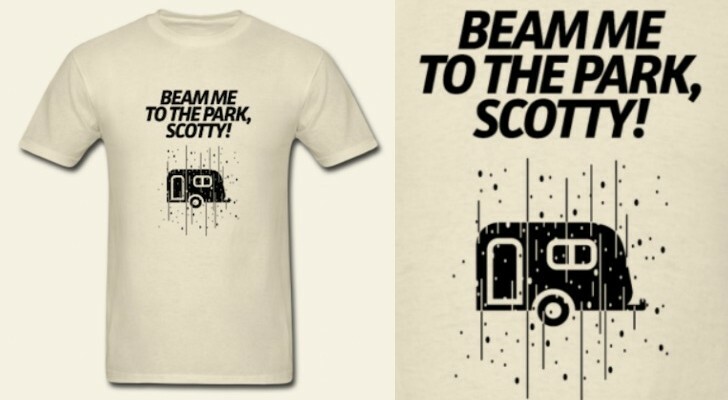 I was inspired by those “Global Trek” RV’s, and I really like the designs done by “Outside Vans”. Unfortunately they use the Sprinter Chassis which I now have and am very disappointed with it’s mechanical reliability. I want the durability of the “Global RV’s” but don’t need the go anywhere ability. I am hoping I can get my design built at a more reasonable cost by carefully selecting systems and finishes. Thank you for your comments. I like much of what you have shown, but be sure your cabinets have sufficient latches! Make room for large things like bicycles, with access to outside if possible. Emergency egress considerations? Good Luck – I will be interested to see how you progress on this project! Nice! I think the NuRVers will like this concept! I sure do!